When my father was a young boy, he adored the spring and summer because that marked berry season. First, in early June, came the strawberries. Then, a two week window of blueberry picking opened up. But it wasn’t until late July that wild raspberries bloomed. He watched and waited as the pale white berries turned a rich rose color, signaling that they were ripe and ready to be eaten. Now, farther south, raspberries reach their prime in mid-June. However, they can be enjoyed even earlier in the spring. 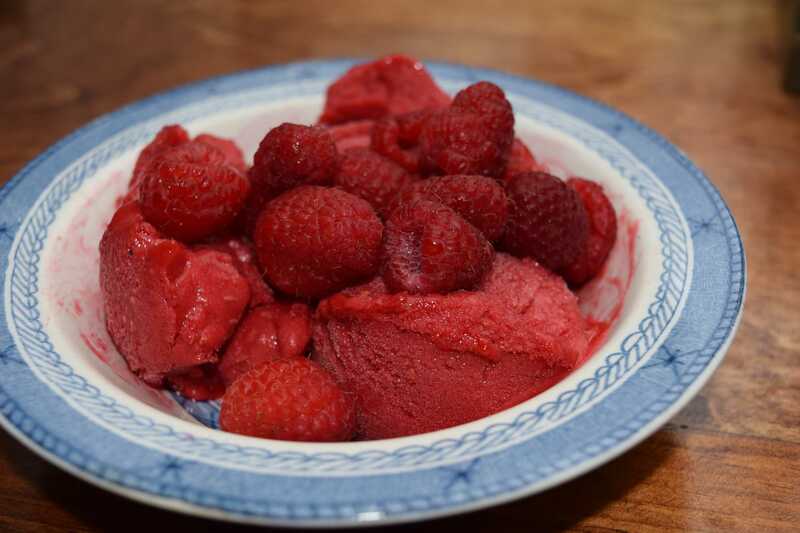 This raspberry sorbet requires few ingredients and not much time to make (although several hours are needed in between for the syrup to cool and then for the sorbet to freeze), and it is a sweet, tart reminder that it’s almost berry picking season. Place the water in a small saucepan over low heat, and stir until the sugar is completely dissolved, 3 to 5 minutes. Boil the mixture for 1 minute, then remove from the heat. Pour the sugar syrup into a container and place in the refrigerator until completely chilled (about 1 ½ hours). Place the raspberries in a saucepan, along with the cooled sugar syrup, bring to a boil, and then simmer for 2 to 3 minutes. Allow the raspberries to cool for a few minutes, then transfer to a blender or food processor until puréed. Pour the raspberry purée into a container and put it in the freezer. When the sorbet is completely frozen (3 to 4 hours), remove from the freezer and let stand at room temperature until partially thawed. Transfer to a food processor or blender, and process to break up ice crystals that have formed on the sorbet. Blending it further gives the sorbet a smooth, fluffy texture. Place the sorbet back into the pan and refreeze for at least 3 hours and up to several days.